The Seamless Toy Company, the company behind a connected building toy called Atoms, has raised $2.1 in funding from a group of investors that include Bono, Apple Software CTO Avie Tevanian, former Apple CFO Fred Anderson and venture firms Promus Ventures, Founder Collective and Proof Ventures. The toys let kids manipulate input, output and logic sensors to build creations using the Atom’s characters or their LEGOs. The funding round could grow to as much as $2.6 million, which is in addition to a successful Kickstarter campaign that raised a bit over $183,000 back in December last year. CEO Michael Rosenblatt has spent the last year trying to build the orders for his toys from the Kickstarter as well as build the company. He’s finally managed to get the toys to ship– albeit much later than originally anticipated. The toys will start shipping next week to customers who backed the Kickstarter and will ship starting Nov. 30 to other customers. The toys themselves are one of four packages containing several Atoms sensor bricks. 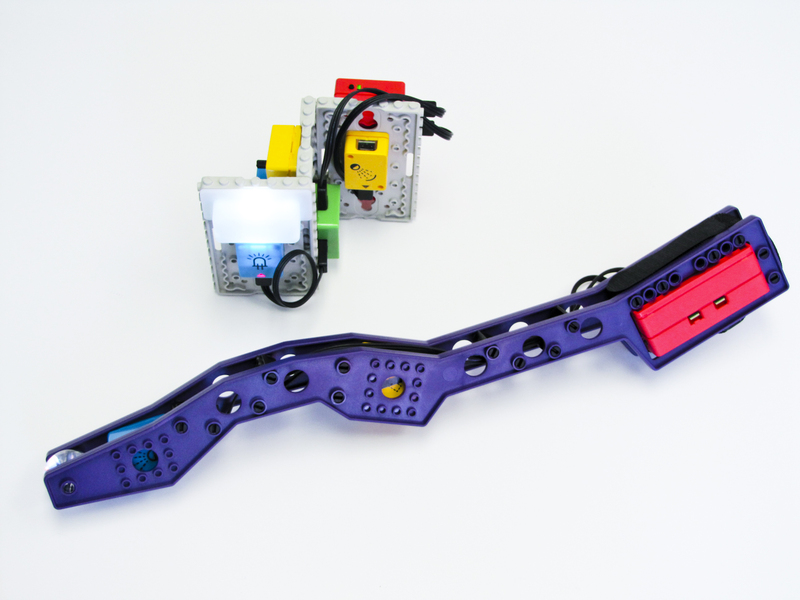 Like many of the connected toys out there such as LittleBits (see disclosure) and Cubelets, Atoms is trying to create playsets that let kids play around with inputs and outputs. So a motion sensor might plug into a gear sensor and when someone walks closer to the toy it rolls backward. I spent an evening playing with Atoms over dinner in San Francisco last month and it was terribly fun. The packaged toys include a robot street cleaner with nine or 10 sensors for $120 and a magic wand for $100 that comes with nine sensors. I’m personally picking up the cheapest package at $50, which lets a kid trigger a spring-loaded pad using a light sensor. I’d like to connect that to some of my other sensors around the house to help me play jokes on my family. While, the toys are fun to play with, they are expensive when considered solely as toys. Rosenblatt explained that they are in line with other toys, and he’s right, but spending $120 on a LEGO set or a doll house might be easier for parents (who often buy with their own childhood toys firmly in mind) wanting to take the “safe” route. However, if Rosenblatt can weather the skepticism in the venture industry to raise his funding — many investors took a meeting but the triple threat of hardware, a consumer product and the low-margin toy market kept them on the sidelines– I’m hopeful that he can convince parents to part with their money. The Atoms are designed to be gender neutral and appeal to a wide variety of ages. They also fit with LEGOs so you can build them into your creations. Rosenblatt said he’s discussed linking Atoms to other connected toys or products, but for now his goal is to get the products in kids’ hands and start the hard part of educating consumers and winning over buyers. They are available online starting today and Rosenblatt expects a retail presence in stores in about six months. Disclosure: True Ventures is an investor in littleBits and the parent company of this blog, Giga Omni Media. Om Malik, founder of Giga Omni Media, is also a venture partner at True.